A "rest area" provides a safe place to sleep for the unhoused with less commitment than a "transitional village" like Eugene's Opportunity Village. Its a similar concept to a highway rest area, but instead services those with no place else to go in urban areas. The camps include two distinct populations: hosts and overnighters. Hosts can stay at the site regularly and enforce a basic set of community agreements. Overnighters are a more transient population that can check-in with a host each night for a safe place to sleep. The idea is to serve more sectors of the unhoused population. This concept originated with Portland's Right 2 Dream Too, which formed just a few blocks from the local Occupy camp in 2011. The informal community has formed an excellent manual for how to operate this kind of service. Read their operating manual here. 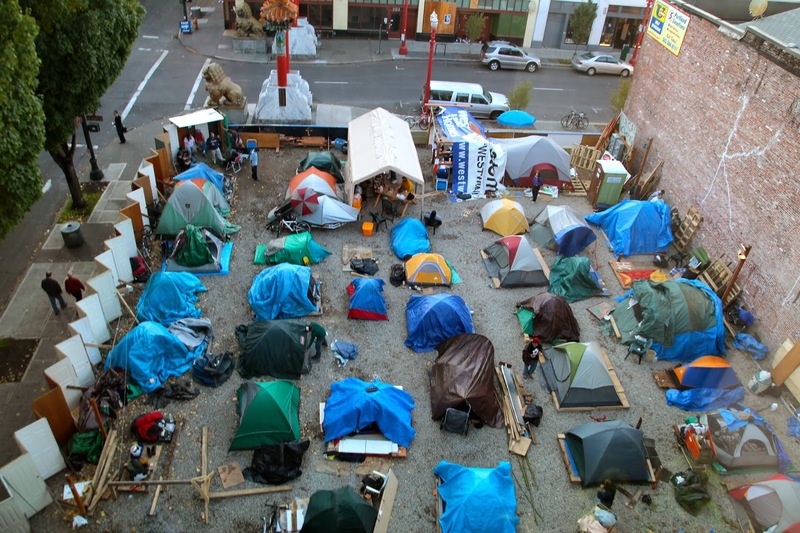 In October 2013, the City of Eugene passed a "rest area" ordinance allowing up to 15 people to camp on city approved sites. The first site opened just down the street from Opportunity Village in late December, known as the Eugene Safe Spot, which features tent platforms and Conestoga huts. An "sanctuary camp" known as Whoville prompted the passage of this ordinance by city council. The tent city has been forced to migrate to several different locations, but has since found sanctuary for four months on a piece of left-over public land at an intersection near downtown. The site has reached physical capacity with 40-50 people camping there along with gathering and cooking spaces. Port-a-pots, hand washing stations, and trash collection is funded by a local non-profit known as the Nightingale Collective. The community has vowed to stick together and move to a different site if the city follows through with eviction. Interestingly, this site adjacent to the University of Oregon was identified by the city council as one of the potential sites for a rest area, but it was not one of the first two sites approved for the initial pilot project. As a result the city has pursued eviction of Whoville, but in a slow and careful manner. Activists have threatened a law suit if the city does not provide a legal alternative based on the grounds of Jones v. City of Los Angeles, which prohibited the city from punishing "involuntary sitting, lying, or sleeping" that is a consequence of being "human and homeless without shelter." A symbolic step was taken last week when the city removed the "no camping" sign and replaced it with a "no trespassing" sign, justifying arrest instead of citation. The sign was "misplaced" the following day. A few days later, a fence was raised around the site with a couple gaps so that residents could still come and go. I get that the tent is not seen as an acceptable form of shelter. I’m not an advocate for the tent. But, we can’t dismiss it in the absence of other alternatives. Whoville is providing a service that the city hasn't. Whoville is providing Shelter First. If we cannot collectively accept this informal solution, then I urge Council to vote tonight to allow Whoville to remain open until a more formal alternative can be implemented. Recently, there has been a lot of talk around Utah’s “Housing First” model. We’ve been told that this is the long-term solution. But at the same time we’re told we don’t have a state tax base or an existing housing stock to support it, and that it’s a solution beyond the control of the city. In the mean time, there are things we can do now locally. How about a Tiny Housing First model? 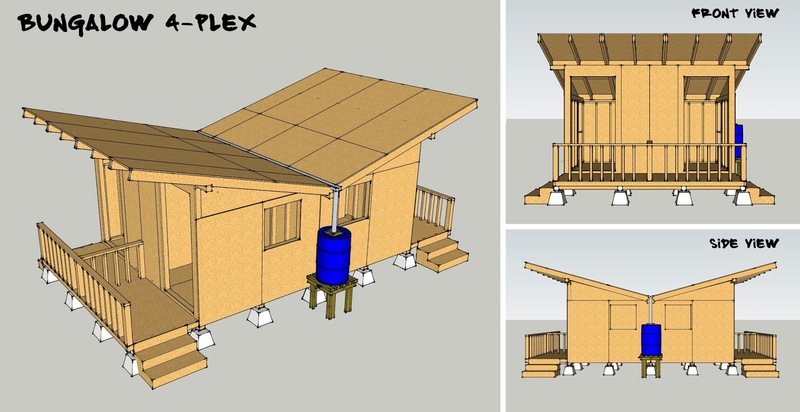 Providing housing that is affordable and sustainable without government subsidy. A reason we’re in this predicament is because our standard of living – and the standard of building – has been grossly inflated beyond the human scale. The average American now consumes 1,000sf of space, whereas at Opportunity Village the average resident requires 78sf of space. The median home sale price in Eugene last year was $200,000, whereas Opportunity Village will cost under half that to build in its entirety. Building small is certainly affordable, but permits and codes that uphold the status quo make it a challenge. I was delighted to read Mayor Piercy’s urge for the city to look for more flexibility in this regard. We need to get micro-housing in the building code and a zoning framework for micro-housing developments that can share facilities in order to keep costs low. Let’s pursue long-term solutions that are within our grasps. Small housing is the future, and by formally accepting that, Eugene can put forth an exemplary housing model that is economically and environmentally sustainable. A real win-win solution. Opportunity Village Eugene (OVE) has made an offer to the city to build a more formal solution for Whoville in an effort to save the community from eviction. The non-profit currently manages one-acre site with 30 transitional micro-housing units along with a shared kitchen, restroom, and gathering areas. This led me to develop a concept plan for an OVE-style rest area. 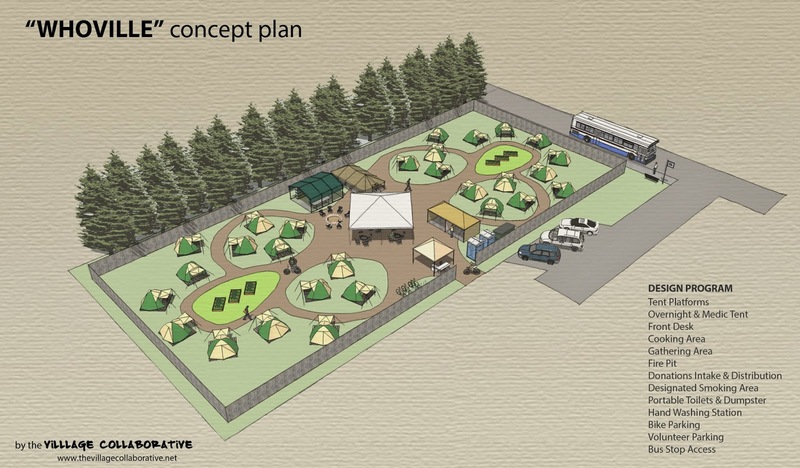 The plan moves beyond the tent, and includes Conestoga huts along with multi-unit bungalows that are a denser version of the tiny homes at Opportunity Village with the goal of fitting more people on a smaller site. A heated yurt and space for tent camping could provide overflow sleeping space. A 4-in-1 bungalow at just under 200 square feet. 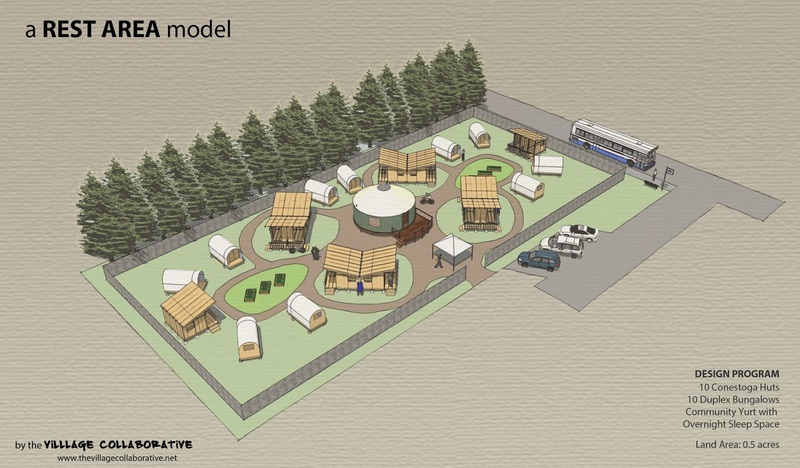 But, in getting feedback from the residents of Whoville, it turned out that they preferred to stay in tents so that everyone would be on the same level, and to keep costs low so that the model could serve more people. They came up with a basic design program that informed the drawing below. 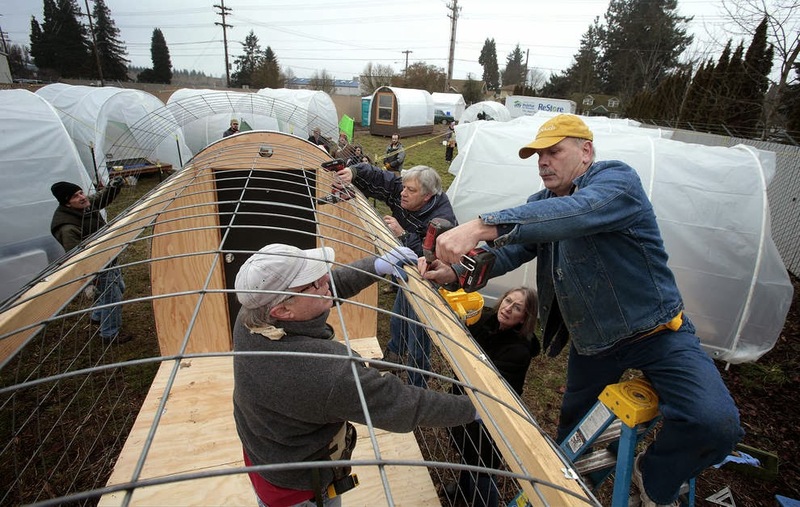 Opportunity Village (tranistional village), Eugene Safe Spot (rest area), and Whoville (sanctuary camp) offer a diverse ecology of citizen-driven initiatives for addressing homelessness. No one model is the right answer, but instead each offers a varied service suitable to separate demographics. The subsequent stage in this ecology is the "affordable village," which offers a next step from a place like Opportunity Village. 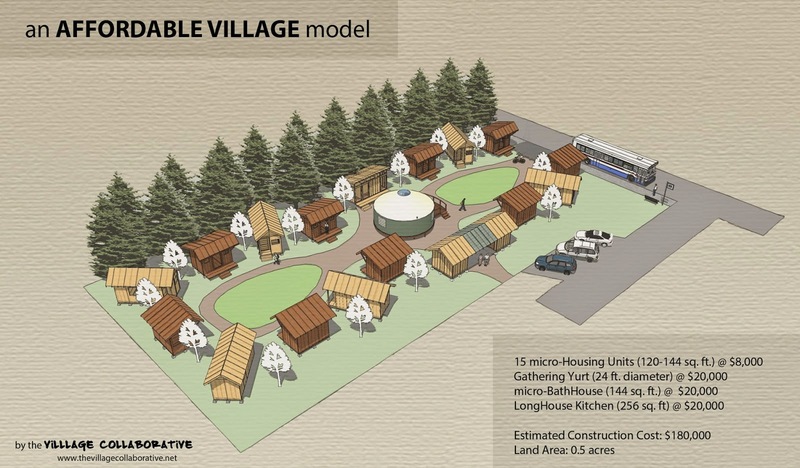 This model has a smaller population with larger, permanent micro-housing units. Here, the line between the housed and the unhoused is blurred, as residents would pay a modest rent to place their tiny house in a similar village model. The low-cost, low-impact development returns the ability to develop affordable housing without a dependence on government subsidy—which has not been the case since SROs became an endangered species. Currently, OVE is in the early planning stages of this kind of development. That's really a nice idea. An unused Car Trailers could be a home for homeless. Thanks for sharing! I have also heard about it that "Its a similar concept to a highway rest area, but instead services those with no place else to go in urban areas. The camps include two distinct populations: hosts and overnighters. Hosts can stay at the site regularly and enforce a basic set of community agreements". Very interesting post. The entire nation's house less can be productive and not disable. We just need the right 'thinkers' and 'doers' to get together and keep the politics out of the process. Dr Andrew Unterweger is a very experience man which is working in real estate company from many years. Had a really appropriate enjoy getting my fence changed! I referred to as for a quote, which changed into very fair, and prompt. I now have a lovely new fence to experience. i can use them once more for destiny tasks get more!